03 Oct Wool market kicks against the wind in Grand Final week. Again, this week saw the wool market give up ground, easing on Tuesday when only Melbourne was selling and this trend continued when Sydney and Fremantle joined in. 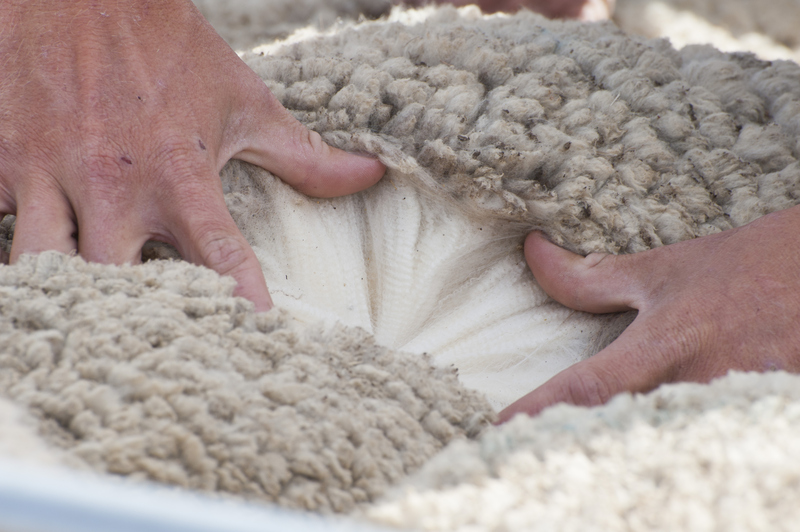 AWEX reported that it was the better style wool early in the week that met subdued demand, although buyers returned to look for bargains by weeks end. The Eastern Market Indicator (EMI) fell 54 cents for the week, coming on top of last week’s 27 cents loss, to end the week at 2,013 cents in AU$. The EMI in US$ terms gave up 39 cents to end the week at 1,461 US cents (Table 1). In Fremantle, the big “correction” came on Wednesday, where the WMI lost 74 cents but posted a more settled result on Thursday, losing another 7 cents to end the week at 2141 cents. This week the Pass-in rate escalated in response to the market movement, with 14.1% of the total offering passed. A special mention goes to Fremantle, where on the first day 47.4% of wool offered was passed with a more modest 18.0% on the final day. This resulted in a clearance to the trade for the week of 28,324 bales, with 4,643 bales passed. This again produced a reduced dollar value compared to last week of $69.6 million, with a combined value of $830.1 million so far this season. In the eight auction weeks since the winter recess, 277,214 bales have been cleared to the trade, 37,592 fewer than the same period last year. The average shortfall cleared to the trade compared to the same time last year now sits at 3,880 bales per week fewer (Figure 2). The elevated Pass-in rates indicated that growers were not pleased with the softer market. With future supply looking tighter growers are prepared to punt on a recovery in the future. A comment from the Rodwells team outlines the thinking going forward, – “Often the peak supply comes through around this time, if the 42K bales rostered for next week is the peak then supply is going to be lean for the rest of the season!”. While falls were across the board, Crossbreds were not as severely punished, however, there were very small offerings to quote. Cardings were particularly hard hit this week, Melbourne reported the Cardings indicator down 80 cents, while Sydney and Fremantle lost over 100 cents. 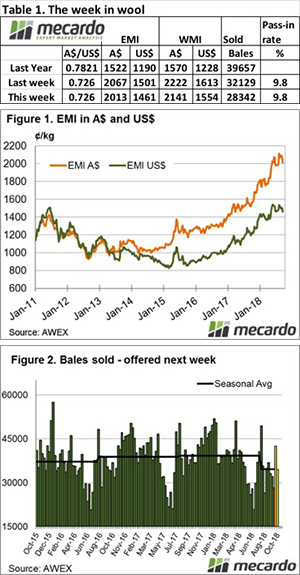 The offering next week is rostered at 42,500 bales, which is most unlikely to get to the auction as growers digest this week’s market correction. The final day was much steadier than the early part of the selling week, so a return from some processors can be expected to support these levels.